Space Invaders will have their revenge upon Wii owners next week, as Square Enix and Taito bring Space Invaders Get Even to WiiWare. 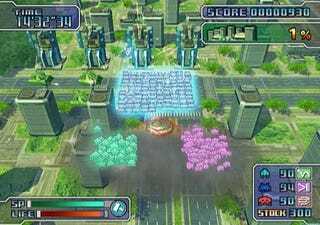 The game, announced earlier this year exclusively for the Wii's downloadable game service, puts players on the invading side in a war against Earth's defense forces. Space Invaders Get Even will hit WiiWare on December 1 capping off the Space Invaders 30th anniversary product flood. While a price point wasn't provided for the standard edition of the four mission-long game, Square Enix did let us know that three mission packs will be released in the future for 500 Wii Points each. Yes, this is starting to sound like an expensive game, in the Square Enix WiiWare fashion. The game is rated E10+, features high score leaderboards and is classified under the "Invade Action" genre. Excellent choice.